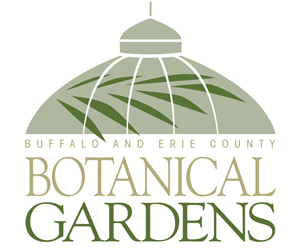 You can enjoy spring flowers inside during winter, weeks before they appear outside in gardens, but you may not want to do it the way they do it at the Buffalo and Erie County Botanical Gardens. 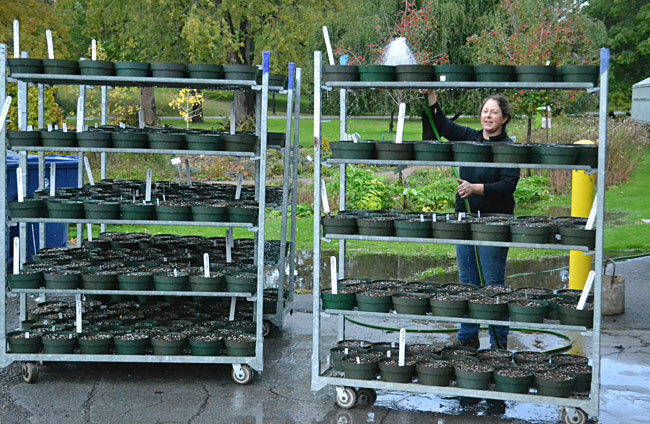 Last week they planted about 21,000 bulbs in pots. 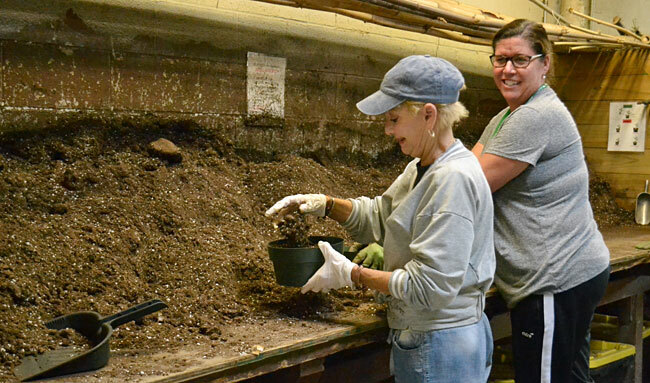 They can’t plant more because “there’s only so much room in our coolers,” said Kristin Popochin, director of horticulture at the Botanical Gardens. Even if you want to try this with just a few bulbs, there is still a question of space. 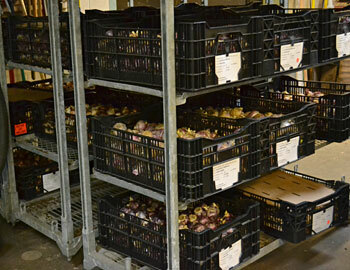 The pots of bulbs are stored in coolers– for 16 to 18 weeks. How much refrigerator space are you willing to give up for four months or so? The other thing is that you don’t have the kind of equipment at home that the Botanical Gardens has. It’s important to make sure the bulbs don’t dry out, and they can monitor the humidity as well as temperature in their coolers. “If you’re opening and closing the refrigerator door, you may get different results,” Pochopin said. Popochin gets instructions from her bulb suppliers for the various varieties of bulbs that will be displayed at the Spring Exhibit, including tulips, narcissus, hyacinths and grape hyacinths. The instructions she follows are precise and more complicated than a home gardener probably wants to contend with. Keep in mind that Popochin has to force bulbs for a very particular period of time. The flowers in the Spring Exhibit have to be ready for the preview, Paradise Under Glass, which will be held on Friday, March 9. In addition, she has to make sure she has blooms throughout the entire exhibit, which will continue through Sunday, April 8. Oh, and the flowers will be color coordinated in different rooms. But even if you don’t follow intricate instructions, you may be able to cool bulbs adequately enough to be able to force them inside. “Plants are really resilient,” she said. Here are some general instructions. Tulips, hyacinths and daffodils are easier to force than something like fritillaria. Plant the bulbs in a pot and keep the potted bulbs at 40 degrees Fahrenheit. Popochin suggests placing them in the refrigerator. 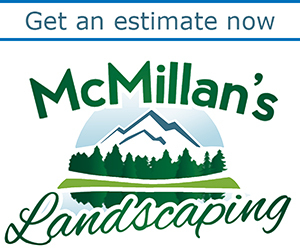 If you try to use an outdoor space such as an unheated garage, not only will it be harder to control the temperature, you might forget about your pots if they’re out of sight. In general, they need about 18 weeks of cold. (You might be able to get by with just 13 weeks or so.) Keep the soil moist, but not soaked. When you take the pot out of the refrigerator, give the sprouts at least a few hours to acclimate to the warmth before you put them in a sunny window. Start watering them. You can also plant spring bulbs outside in garden beds now, Pochopin said. You have until the ground is frozen to get the bulbs in. Her contacts at the bulb companies say that it’s better to plant when the weather is cooler than when it is warmer. “The rule of thumb in Holland is that you should be planting in a sweater, not a T-shirt,” Pochopin said.